Look out!! It's a giant albino alligator! And an avenging angel! And a bloodsucking chupacabra! And a band of crazed cultists! And . . .
All right. What are the zombies doing here?! . . . "Dead, comma, walking"? Cute. Very cute. Look, we've got a lot of threats to humanity here, and it'll be easier for everyone if we don't have any trying to jump their place in line. Yes, I know it was my idea to have everyone face the dangers of GURPS Monster Hunters 3: The Enemy in alphabetical order. In hindsight, this might not have been the most inspired adventure design. Perhaps having untold abominations line up in an orderly queue creates more problems than it solves. Still, I'm trying to sort this out. 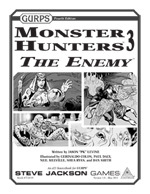 Monster Hunters 3: The Enemy is a great supplement, and I want to use as much of it as I can, as soon as I can. Has anyone seen the witches? Witches, anyone? No? All right; fine. Let's break for lunch. What's that? The werewolves and weretigers are no longer hungry? Terrific. Yes, the alphabetical queue was definitely a bad idea. Here in the States it's Memorial Day, the day dedicated to the memory of the men and women who have fallen defending this country. We're not in the office. Voicemail and e-mail will be dealt with Tuesday. Warehouse 23 is also closed; e23 will continue to process orders automagically, but customer service issues will be dealt with tomorrow.